Below are instructions to create/edit button links on your web pages. Linking to a PDF you have uploaded to the media gallery? Watch video tutorial OR view text tutorial starting at STEP 1: Find a Document's URL. Linking to a web page or web form? Watch video OR view text tutorial starting at STEP 2: Create or Edit a Button Link. 1. Click the Add Media button of your page to upload a new document (PDF, Xe, or to find an existing document. If it has already been uploaded, go to the following step. 2. While in the Media Gallery, select the file and copy the document's URL. 3. Find the page where the button will be or is located, and click Edit. You have three color options for buttons: black (default), orange, and white. 1. in edit mode, hover over the shortcode icon. Click "Button"
Label: The text to display in the button. We suggest up to 5 words. URL: This is where you will place the URL for the website, webpage or file. It must have http:// or https://. Choose a Theme: You may select the color of the button of your choosing. The options are Orange, Black or White. Action Method: Always leave as Link URL (default). Open Link in new tab: Check the box for links leaving your website or PDF documents. 3. The shortcode will be added to your page content. 4. When you preview or update the page, the page will display the new button. 1. 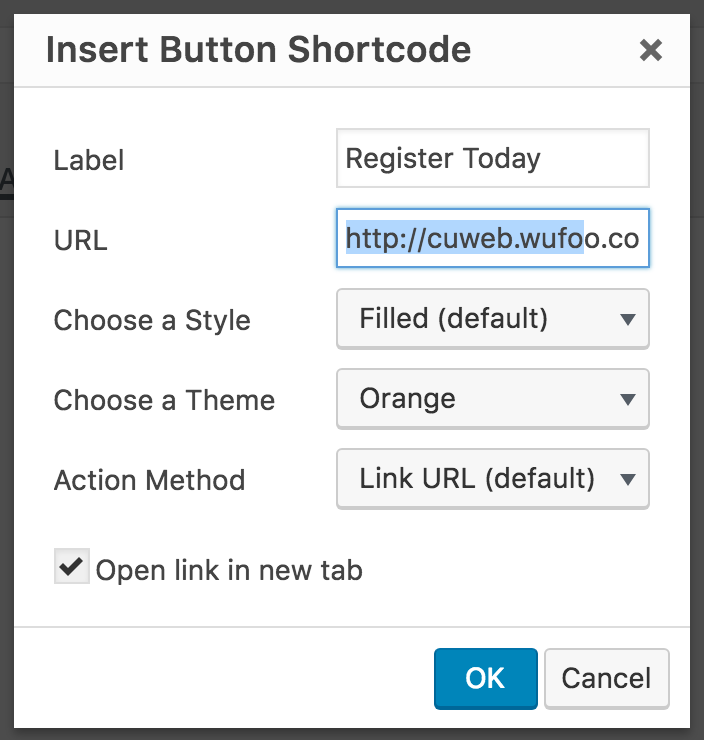 Follow these steps to swap out the old file URL link in the button code. 2. Click Update to save the changes.